Despite some early volatility, September ended up being a positive month for most financial markets. This capped off a solid quarter where markets also saw gains across the board. Here in the U.S., the Dow Jones Industrial Average led the pack with a 2.16-percent gain for September. The S&P 500 Index was up 2.06 percent for the month, and the Nasdaq Composite gained 1.11 percent. On a quarterly basis, the Nasdaq had the best return, climbing 6.06 percent. The Dow was right behind with a 5.58-percent return for the quarter, while the S&P 500 finished up 4.48 percent. These positive results were backed up by solid fundamentals. According to FactSet, as of September 29, the estimated third-quarter earnings growth rate for the S&P 500 was 4.2 percent. This growth is expected to be broad based—occurring in 8 of the 11 sectors—with the energy sector leading the pack. Despite the recent hurricanes, more companies have issued positive guidance than negative, which is another good sign. Even so, it will be important to watch actual earnings for the third quarter, as the effects of the hurricanes remain uncertain. Technical factors were also supportive for all three U.S. indices during the quarter. Internationally, results were similar. The MSCI EAFE Index gained 2.49 percent for September and 5.40 percent for the quarter on better economic and political news, especially in Europe. Emerging markets experienced a small pullback in September, which led to a 0.38-percent decline in the MSCI Emerging Markets Index. But the index outperformed all other equity indices for the quarter, surging 8.04 percent. Much of this outperformance in emerging markets can be attributed to the declining value of the dollar during the quarter. Technicals for developed and emerging indices were positive, as both remained well above their trend lines for the quarter. In the fixed income space, results were mixed. The Bloomberg Barclays U.S. Aggregate Bond Index lost 0.48 percent in September. A sell-off in global fixed income toward month-end caused domestic interest rates to rise to their highest levels in more than two months. In addition, the yield on the 10-year Treasury bond increased from 2.16 percent at the start of the month to 2.33 percent by month-end due to expectations that the Federal Reserve would start raising rates. For the quarter, however, the index was up 0.85 percent. High-yield corporate bonds had a strong month and quarter, with spreads remaining near post-recession lows. The Bloomberg Barclays U.S. Corporate High Yield Index notched gains of 0.90 percent and 1.98 percent for the month and quarter, respectively. Beginning in mid-August with Hurricane Harvey, the Eastern Seaboard saw three major storms touch down in U.S. territory. The damage they caused to both people and property was tremendous, and we are just starting to see some of the economic impact. Housing, for example, which had been an area of strength, showed signs of weakening. In August, both new and existing home sales declined. Although discouraging, these results were likely due to tight supply. (Housing inventory is down 6.5 percent compared with this time last year.) There could be some hurricane effects showing up in these numbers as well, as dramatic weather decreased home sales in the South. Homebuilder confidence also declined. This could be due to worries about supply and labor shortages as both are diverted to rebuilding in the storm states. This measure remains in expansionary territory, however. And while confidence may have slipped, homebuilders are clearly responding to low supply levels: both building permits and housing starts increased in August. 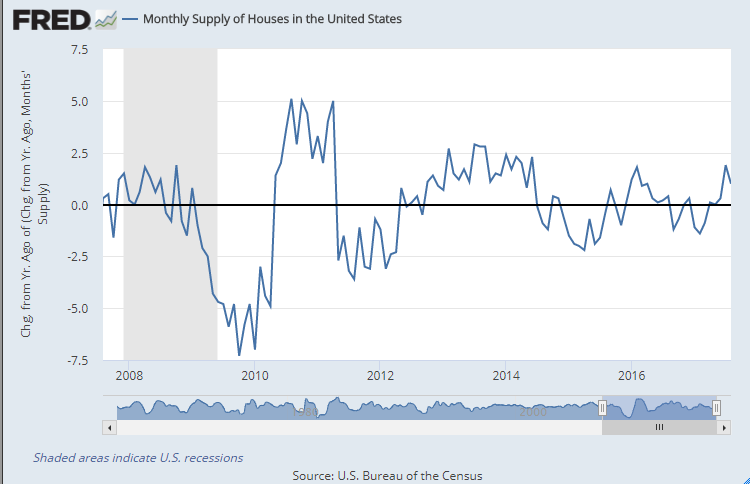 In fact, as you can see in the following chart—which compares the supply of housing on a year-over-year basis—builders have increased efforts to create new housing stock in the past few months. While homebuilder confidence declined slightly in August, consumer and business confidence remained strong. Consumer sentiment, as measured by the Conference Board and University of Michigan surveys, remained near year-to-date highs. In fact, the Conference Board survey currently sits at its second-highest level since 2001. Consumers validated these strong confidence numbers with actual dollars spent. Looking at August’s retail sales report, the headline figure, which includes volatile auto sales, declined. But the core reading, which strips out autos, rose by 0.2 percent—a solid if not spectacular figure. Again, however, this data was likely affected by the hurricanes, as vehicle sales in the storm-hit regions dropped dramatically. Businesses also had positive news on the confidence and spending fronts. The Institute for Supply Management’s manufacturing and nonmanufacturing indices both increased by more than expected, indicating that business confidence remains strong. The manufacturing index for September was especially positive, reaching its highest level in 13 years. As was the case with consumers, this confidence also translated into solid hard spending data. The best economic indicator—orders for business equipment—posted a strong 0.9-percent gain, following an upwardly revised 1.1-percent increase in July. This suggests that, after rising substantially in the second quarter, business investment is on track for another increase in the third quarter. This has been one of the weak areas of the recovery, so these gains in the face of the storms are a positive indicator. Given the continued strength of the U.S. economy, as well as the synchronized expansion around the world, the major source of market risk comes from politics. The next story we’ll want to pay attention to is the Trump administration’s tax reform proposal and the effects any changes to the tax code could have on the economy. From an economic perspective, there are more opportunities than risks here. And with the deferral of the debt ceiling issue to December, political risks in the U.S. are lower than they have been in recent months. International politics is a different story. In Germany, the recent election left Angela Merkel’s Christian Democratic Union in control. This helped calm concerns, but the inclusion of a substantial populist voting bloc showed that the potential for political disruption in this dominant European country remains very real. Other areas of political risk include Spain, where violence around the Catalan independence referendum at month-end cast a pall on the economy. The United Kingdom, where the negotiations around an exit from the European Union are becoming increasingly difficult, is another focal point. Concerns in Asia rose as well. North Korea remains a very big issue. Also, in Japan, snap elections could cause Prime Minister Shinzo Abe to lose power for the first time since 2012. Abe has served as a key U.S. ally during his tenure, so this change would certainly introduce volatility. In China, the pending People’s Congress has the potential for surprises as well. While the U.S. is relatively stable, international risks are rising to a level we haven’t seen for some time. None of these risks seems to be at a level that could disrupt the global economy, but we need to keep our eyes open. Although very real risks are out there, they have had remarkably little effect on the economy and the financial markets. As long as the economic fundamentals remain sound, growth tends to continue, and that’s what we’re seeing today. Of course, this does not mean we won’t see more volatility. We will. In fact, given recent complacency, any volatility will feel worse than ever. As noted above, politics is the major issue right now, and it could well rock markets. But even with those political risks, the solid economic growth trends around the world put us in a better place to weather any issues that may arise. Fundamentals ultimately drive long-term performance, and the fundamentals remain solid. While volatility is inevitable, as long as we focus on long-term performance and meeting our goals, short-term pullbacks can offer more of an opportunity than a threat. As always, a well-diversified portfolio that aligns financial goals and timelines remains the best way to get where you want to go. Authored by Brad McMillan, senior vice president, chief investment officer, and Sam Millette, fixed income analyst, at Commonwealth Financial Network®.